This article is about the English band. For the Colombian band, see Génesis (band). For other bands, see Genesis (disambiguation). Genesis were an English rock band formed at Charterhouse School, Godalming, Surrey, in 1967. The most successful and longest-lasting line-up consisted of keyboardist Tony Banks, bassist/guitarist Mike Rutherford and drummer/singer Phil Collins. Significant former members were original lead singer Peter Gabriel and guitarist Steve Hackett. The band moved from folk music to progressive rock in the 1970s, before moving towards pop at the end of the decade. They have sold 21.5 million copies of their albums in the United States, with worldwide sales of between 100 million and 150 million. Formed by five Charterhouse pupils including Banks, Rutherford, Gabriel, and Anthony Phillips, Genesis were named by former pupil Jonathan King, who arranged for them to record several unsuccessful singles and their debut album From Genesis to Revelation in 1968. After splitting with King, the group began to tour professionally, signed with Charisma Records and recorded Trespass (1970) in the progressive rock style. Following the departure of Phillips, Genesis recruited Collins and Hackett and recorded Nursery Cryme (1971). Their live shows also began to be centred on Gabriel's theatrical costumes and performances. They were first successful in mainland Europe, before entering the UK charts with Foxtrot (1972). In 1973, they released Selling England by the Pound (1973), which featured their first UK top 30 single "I Know What I Like (In Your Wardrobe)". The concept album The Lamb Lies Down on Broadway followed in 1974, and was promoted with a transatlantic tour featuring an elaborate stage show. Following the Lamb tour, Gabriel left Genesis in August 1975 to begin a solo career. After an unsuccessful search for a replacement, Collins took over as lead singer, while Genesis gained popularity in the UK and the US. Following A Trick of the Tail and Wind & Wuthering (both 1976), Hackett left, reducing the band to Banks, Rutherford, and Collins. Genesis' next album ...And Then There Were Three... produced their first UK top ten and US top 30 single in 1978 with "Follow You Follow Me", and they continued to gain success with Duke (1980), Abacab (1981), and Genesis (1983), reaching a peak with Invisible Touch (1986), which featured five US top five singles. Its title track reached number one in the US. After the tour for We Can't Dance (1991), Collins left Genesis in 1996 to focus on his solo career. Banks and Rutherford recruited Ray Wilson for Calling All Stations (1997), but a lack of success in the US led to a group hiatus. Banks, Rutherford and Collins reunited for the Turn It On Again Tour in 2007, and with Gabriel and Hackett were interviewed for the 2014 BBC documentary Genesis: Together and Apart. The founding members of Genesis, singer Peter Gabriel, keyboardist Tony Banks, guitarist Anthony Phillips, bassist and guitarist Mike Rutherford, and drummer Chris Stewart, met at Charterhouse School, a private school in Godalming, Surrey. Banks and Gabriel arrived at the school in September 1963, Rutherford in September 1964, and Phillips in April 1965. The five were members in one of the school's two bands; Phillips and Rutherford were in Anon with singer Richard Macphail, bassist Rivers Jobe, and drummer Rob Tyrrell, while Gabriel, Banks, and Stewart made up Garden Wall. In January 1967, after both groups had split, Phillips and Rutherford continued to write together and proceeded to make a demo tape at a friend's home-made studio, inviting Banks, Gabriel, and Stewart to record with them in the process. The five recorded six songs: "Don't Want You Back", "Try a Little Sadness", "She's Beautiful", "That's Me", "Listen on Five", and "Patricia", an instrumental. When they wished to have them professionally recorded they sought Charterhouse alumnus Jonathan King, who seemed a natural choice as their publisher and producer following the success of his 1965 UK top five single, "Everyone's Gone to the Moon". A group friend gave the tape to King who was immediately enthusiastic. Under King's direction, the group, aged between 15 and 17, signed a one-year recording contract with Decca Records. From August to December 1967, the five recorded a selection of potential singles at Regent Sound Studios on Denmark Street, London, where they attempted longer and more complex compositions, but King advised them to stick to more straightforward pop. In response Banks and Gabriel wrote "The Silent Sun", a pastiche of the Bee Gees, one of King's favourite bands, which was recorded with orchestral arrangements added by Arthur Greenslade. The group exchanged various names for the band, including King's suggestion of Gabriel's Angels and Champagne Meadow from Phillips, before taking King's suggestion of Genesis, indicating the start of his production career. King chose "The Silent Sun" as their first single, with "That's Me" on the B-side, released in February 1968. It achieved some airplay on BBC Radio One and Radio Caroline but it failed to sell. A second single, "A Winter's Tale" / "One-Eyed Hound", followed in May 1968 which also sold little. Three months later, Stewart left the group to continue with his studies. He was replaced by fellow Charterhouse pupil John Silver. King felt the group would achieve greater success with an album. The result, From Genesis to Revelation, was produced at Regent Sound in ten days during their school's summer break in August 1968. King assembled the tracks as a concept album which he produced, while Greenslade added further orchestral arrangements to the songs, something the band were not informed of until the album was released. Phillips was particularly upset about Greenslade's additions. When Decca found an American band already named Genesis, King refused to change his group's name. He reached a compromise by removing their name from the album cover, resulting in a minimalist design with the album title printed on a plain black background. When the album was released in March 1969 it became a commercial failure, because record shops put the album in the "Religious" section upon seeing the cover. Banks recalled the album "after a year or so, had sold 649 copies". A third single, "Where the Sour Turns to Sweet" / "In Hiding", was released in June 1969. None of the releases were commercially successful and led to the band's split with King and Decca. King continues to hold the rights to the album which has seen numerous reissues. In 1974, it peaked the US chart at No. 170. When the album was recorded, the band went their separate ways for a year; Gabriel and Phillips stayed at Charterhouse to finish exams, Banks enrolled at Sussex University, and Rutherford studied at Farnborough College of Technology. They regrouped in mid-1969 to discuss their future as their offers in further education would result in the group splitting up. Phillips and Rutherford decided to make music a full-time career as they were starting to write more complex music than their earlier songs with King. After Banks and Gabriel decided to follow suit, the four returned to Regent Sound in August 1969 and recorded four more demos with Silver: "Family" (later known as "Dusk"), "White Mountain", "Going Out to Get You", and "Pacidy". The tape was rejected by each record label that heard it. Silver then left the group to study leisure management in the United States. His replacement, drummer and carpenter John Mayhew, was found when Mayhew looked for work and left his phone number "with people all over London"
In late 1969, Genesis retreated to a cottage that Macphail's parents owned in Wotton, Surrey to write, rehearse, and develop their stage performance. They took their work seriously, playing together for as much as eleven hours a day. Their first live gig as Genesis followed in September 1969 at a teenager's birthday. It was the start of a series of live shows in small venues across the UK which included a radio performance broadcast on BBC's Night Ride show, on 22 February 1970 and a spot at the Atomic Sunrise Festival held at the Roundhouse in Chalk Farm a month later. During this time, the band met with various record labels regarding contract offers. Initial discussions with Chris Blackwell of Island and Chris Wright of Chrysalis were unsuccessful. In March 1970, during the band's six-week Tuesday night residency at Ronnie Scott's Jazz Club in Soho, members of Rare Bird, who Genesis had supported earlier, recommended the band to producer and A&R man John Anthony of Charisma Records. Anthony attended one of their shows and enjoyed them enough to convince his boss, label owner Tony Stratton-Smith, to watch their next appearance. Stratton-Smith recalled, "Their potential was immediately apparent ... the material was good and their performance was good ... It was a long shot, because they needed time to find their strength ... but I was prepared to make that commitment". Stratton-Smith agreed to a record and management deal within two weeks, paying Genesis an initial sum of £10 a week (equivalent to £200 in 2019). Genesis stayed at Wotton until April 1970, by which time they had enough new material for a second album. Recording for Trespass began in June at Trident Studios, London with Anthony as producer and David Hentschel hired as assistant engineer. The album included longer and more complex songs than their first with folk and progressive rock elements with various time signature changes, as in the nine-minute song "The Knife". Trespass is the first in a series of three Genesis album covers designed by Paul Whitehead. He had completed the cover before the band decided to include "The Knife" on the album. Feeling the cover no longer reflected the album's overall mood, the band persuaded Whitehead to slash a knife across the canvas and have the result photographed. Released in October 1970, Trespass reached No. 1 in Belgium in 1971 and No. 98 in the UK in 1984. "The Knife" was released as a single in May 1971. Rolling Stone briefly mentioned the album with a negative view following its 1974 reissue: "It's spotty, poorly defined, at times innately boring". "Genesis seemed to be dying a death around our second album," Gabriel told Mark Blake. "We couldn't get arrested. So I got a place at the London School of Film Technique." "That was the closest we came to busting up. For some reason we felt so close that if one left, we thought we couldn't carry on. Of all the changes we've been through, surviving Ant leaving was the hardest." After Trespass was recorded, ill health and developing stage fright caused Phillips to leave Genesis. His last show with the band took place in Haywards Heath on 18 July 1970. He felt the increased number of gigs affected the group's creativity and that several songs he wrote were not recorded or performed live. He had contracted bronchial pneumonia and became isolated from the rest of the band, feeling that it had too many songwriters in it. Banks, Gabriel, and Rutherford saw Phillips as an important member, being the most instrumental in encouraging them to turn professional. They regarded his exit as the band's greatest threat and the most difficult to overcome. Gabriel and Rutherford decided they would continue; Banks agreed on the condition that they find a new drummer that was of equal stature to the rest of the group. Mayhew was therefore fired, though Phillips later thought Mayhew's working-class background clashed with the rest of the band, which affected his confidence. The search for a new guitarist and drummer began with advertisements placed in copies of Melody Maker. The invitation was spotted by drummer Phil Collins, formerly of Flaming Youth who already knew Stratton-Smith. He recalled, "My only knowledge of Genesis was through seeing the ads for their gigs. It seemed like they were constantly working. ... I thought 'At least I'm going to be working if I get the gig'." Roger Taylor, subsequently of Queen, turned down an invitation to audition. Collins went to the audition at Gabriel's parents' house in Chobham, Surrey with his Flaming Youth bandmate, guitarist Ronnie Caryl. As they arrived early, Collins took a swim in the pool and heard what the other drummers were playing. "They put on 'Trespass', and my initial impression of a very soft and round music, not edgy, with vocal harmonies and I came away thinking Crosby, Stills and Nash". Gabriel and Rutherford noticed the confident way Collins approached and sat at his drum kit and knew he would be the right replacement. Banks said, "It was a combination of things. He could make it swing a little bit ... he could also tell good jokes and make us laugh ... And he could sing, which was an advantage because Mike and I were not very good at back-up vocals". In August 1970, Collins became the new drummer for Genesis. Caryl's audition was unsuccessful; Rutherford thought he was not the player the group were looking for. After a short holiday, Genesis began to write and rehearse as a four-piece band in Farnham, Surrey. The now empty guitar sections in their songs allowed Banks and Rutherford to expand their sound and play what Gabriel described as "interesting chords". As they had not found a new guitarist, Genesis resumed as a live act with Rutherford adding bass pedals and Banks playing lead guitar lines on a Pianet through a distorted fuzz box amplifier in addition to his keyboard parts, something that he credits in helping him develop his technique. In November 1970, after a second audition with Caryl fell through, Dave Stopps, owner of Friars club in Aylesbury, suggested they use Mick Barnard of The Farm, who joined the band for their gigs which included Genesis's television debut on BBC's Disco 2. After two months of performances, the band found Barnard lacked in expertise and wished to try someone else. In December, Gabriel spotted a Melody Maker advert from Steve Hackett, formerly of Quiet World, who wanted to join a band of "receptive musicians, determined to drive beyond existing stagnant music forms". Gabriel advised Hackett to become familiar with Trespass and attend their upcoming gig at the Lyceum Theatre in London. Hackett auditioned with the group in a flat in Earls Court and formed an instant rapport with Rutherford through a common interest in inverted chords. After Hackett joined in January 1971, Stratton-Smith organised a UK tour with Genesis opening for fellow Charisma acts Lindisfarne and Van der Graaf Generator. Their first overseas dates took place in March with gigs in Belgium followed by their first of three consecutive appearances at the annual Reading Festival on 26 June. Rehearsals for the band's third album, Nursery Cryme, took place at Luxford House near Crowborough, East Sussex that Stratton-Smith had owned. Recording began at Trident Studios in August 1971 with Anthony and Hentschel reprising their respective roles as producer and assistant engineer. The band's sound evolved with Hackett's more aggressive electric guitar work and Banks adding a Mellotron previously owned by King Crimson to his set of keyboards. The opening track, "The Musical Box", originated when Phillips and Mayhew were in the group. The band developed the piece further including the addition of new guitar parts from Hackett. The album marks the first instance of Hackett using the tapping technique which is featured on "The Musical Box" and "The Return of the Giant Hogweed". Hackett and Collins wrote "For Absent Friends" and marks the first Genesis track with Collins on lead vocals. Whitehead depicted scenes and characters from the lyrics to "The Musical Box" and a Victorian manor house based on Gabriel's parent's home on the album's cover. Nursery Cryme was released in November 1971 and went on to reach No. 39 in the UK in 1974. Though the group still had a minor cult following at home, they started to achieve commercial and critical success in mainland Europe, with the album reaching No. 4 in the Italian charts. From November 1971 to August 1972, Genesis toured to support the album which included further visits to Belgium, and Italy for the first time where they played to enthusiastic crowds. They recorded radio sessions for BBC's Sounds of the Seventies program in January and March and performed at the Reading Festival that was praised by numerous critics who attended. During the tour Genesis recorded "Happy the Man", a non-album single, with "Seven Stones" from Nursery Cryme on its B-side. Gabriel in 1974 performing "Watcher of the Skies", dressed in a cape with bat wings and fluorescent makeup. Following rehearsals in a dance school in Shepherd's Bush, Genesis recorded Foxtrot at Island Studios between August and September 1972. During the initial sessions, disagreements among Charisma and Anthony contributed to the end of his association with Genesis. After two replacement engineers were tried out, the band settled with John Burns and a new producer, Dave Hitchcock. The album features the 23-minute track "Supper's Ready", a suite of various musical segments. The track included an opening acoustic piece, a Gabriel-penned song called "Willow Farm" and a piece derived from a jam by Banks, Rutherford and Collins called "Apocalypse in 9/8". Other songs were the science-fiction themed "Watcher of the Skies" and the property development-themed "Get 'Em Out By Friday". Foxtrot was released in October 1972 and reached No. 12 in the UK. It fared even better in Italy, where it went to No. 1. Foxtrot was well received from critics. Chris Welch of Melody Maker thought Foxtrot was "a milestone in the group's career", "an important point of development in British group music", and that Genesis had reached "a creative peak". Stephen Thomas Erlewine thought Foxtrot marked the first time "Genesis attacked like a rock band, playing with a visceral power". The Foxtrot tour covered Europe and North America from September 1972 to August 1973. The show at the National Stadium in Dublin on 28 September 1972 marked the debut of Gabriel wearing a costume on stage, something that surprised the other band members as they were kept uninformed. Originally suggested by Charisma booking agent Paul Conroy, Gabriel went off stage during an instrumental section in "The Musical Box" and reappeared in his wife's red dress and a fox's head. The incident resulted in front cover reports in the music press, allowing the band to double their performance fee. In December 1972, Stratton-Smith organised the band's first gigs in the US with a show at Brandeis University in Waltham, Massachusetts and Philharmonic Hall in New York City with openers String Driven Thing, in aid of the United Cerebral Palsy Fund. They were well received despite the band complaining of technical issues. Gabriel's costumes expanded in the following months to include fluorescent face paint and a cape fitted with bat wings for "Watcher of the Skies", several guises throughout "Supper's Ready", and a mask of an old man for "The Musical Box". An album of recordings from the following UK leg, initially recorded for the American radio program King Biscuit Flower Hour, was released as Genesis Live in July 1973. It reached No. 9 in the UK and No. 105 in the US. Selling England by the Pound was recorded at Island Studios in August 1973, the second Genesis album that Burns co-produced. Much of it was written at Una Billings School of Dance and Chessington. Gabriel contributed lyrics based on the idea of commercialism and the decline of English culture and the rise in American influences. Its title refers to a UK Labour Party slogan to make it clear to music critics who may have thought Genesis were beginning to "sell out" to the US. "Firth of Fifth" features an extended electric guitar solo from Hackett. The album's cover is a modified version of a painting named The Dream by Betty Swanwick who added a lawn mower to tie the image to the lyrics of "I Know What I Like (In Your Wardrobe)". Selling England by the Pound was released in October 1973 to a positive critical reception, though slightly more muted than Foxtrot. The album reached No. 3 in the UK and No. 70 in the US. By this time, Genesis had made little effort to organise their finances and were £150,000 in debt (equivalent to £1,781,800 in 2019).. They hired promoter Tony Smith as their new manager to improve their fortunes and published the band's subsequent music through his company, Hit & Run Music Publishing. The Selling England by the Pound tour visited Europe and North America between September 1973 and May 1974. Their six shows in three days at The Roxy in Los Angeles were well received by audiences and critics. The success of the tour earned the group the "Top Stage Band" title by readers of NME. At its conclusion, Macphail resigned as their tour manager as he wished to pursue other interests. "I Know What I Like (In Your Wardrobe)" was released as a UK single with "Twilight Alehouse", a non-album track recorded in 1972, that reached No. 21 following its release in February 1974. Its success led to an offer for Genesis to appear on BBC's national show Top of the Pops; they declined as the group thought it would not suit their image. In June 1974, Genesis started work on their double concept album The Lamb Lies Down on Broadway. It marked the start of Gabriel's increasingly strained relationship on the rest of the group which contributed to his departure. The album was written at Headley Grange in East Hampshire where, upon their arrival, the building was in a state left by the previous band with excrement on the floor and rat infestations. Gabriel objected to Rutherford's idea of an album based on The Little Prince by Antoine de Saint-Exupéry, thinking the idea was "too twee". He persuaded the band with a less fantastical and more complicated story involving Rael, a Puerto Rican youth living in New York City who embarks on a spiritual quest to establish his freedom and identity while meeting several bizarre characters on the way. Gabriel wrote the story with influences from West Side Story, "a kind of punk" twist to Pilgrim's Progress, author Carl Jung, and the film El Topo by Alejandro Jodorowsky. Most of the album's lyrics were written by Gabriel, leaving much of its music to the rest of the group. His absence from a considerable amount of writing sessions due to difficulties with his wife's first birth was something Rutherford and Banks "were horribly unsupportive" of. Gabriel also left the group when director William Friedkin asked him to write a screenplay, but returned after the project was shelved. In August 1974, production moved to Glaspant Manor in Carmarthenshire, Wales with Burns as co-producer, operating Island Studios' mobile equipment. Further work and mixing took place at Island where Brian Eno contributed synthesizers and effects that the album's sleeve credits as "Enossification". When Gabriel asked Eno how the band could repay him, Eno said he needed a drummer for his track "Mother Whale Eyeless". Collins said, "I got sent upstairs as payment". Gabriel was pleased with Eno's work but Banks was less enthusiastic. The Lamb Lies Down on Broadway was released in November 1974 and reached No. 10 in the UK and No. 41 in the US. "Counting Out Time" and "The Carpet Crawlers" were released as singles in 1974 and 1975, respectively. Its sleeve is the first of four Genesis albums designed by Storm Thorgerson and Aubrey Powell of Hipgnosis. From November 1974 to May 1975, Genesis completed 102 dates across North America and Europe as part of The Lamb Lies Down on Broadway tour. Their set included The Lamb... performed in its entirety with an encore, a decision that was not supported by the entire band considering most of the audience were not yet familiar with the large amount of new material. The stage show involved new, more elaborate costumes worn by Gabriel, three backdrop screens that displayed 1,450 slides from eight projectors, and a laser lighting display. Music critics often focused their reviews on Gabriel's theatrics and took the band's musical performance as secondary which irritated the rest of the band. During their stay in Cleveland during the tour, Gabriel told the band he would leave at its conclusion. He wrote a statement regarding his departure to the English press that was published in August 1975 titled "Out, Angels Out", explaining he had become disillusioned with the music industry and wanted to spend extended time with his family. Banks later stated, "Pete was also getting too big for the group. He was being portrayed as if he was 'the man' and it really wasn't like that. It was a very difficult thing to accommodate. So it was actually a bit of a relief." Following the Lamb tour, Hackett recorded his first solo album Voyage of the Acolyte as he felt unsure that Genesis would survive following Gabriel's departure. He reconvened with the remaining group members in London in July 1975. Collins' idea of continuing as an instrumental group was quickly rejected by the group as they thought it would become boring. Rehearsals for A Trick of the Tail took place in Acton where material was quickly written and with little effort; most of "Dance on a Volcano" and "Squonk" was put together in the first three days. Recording began in October 1975 at Trident Studios with Hentschel as producer. As a replacement singer had not been found, the band decided to record the album without vocals and audition singers as they went. They placed an anonymous advertisement in Melody Maker for "a singer for a Genesis-type group" which received around 400 replies. Collins proceeded to teach selected applicants the songs; Mick Strickland was invited into the studio to sing, but the backing tracks were in a key outside of his natural range and the band decided not to work with him. Having failed to find a suitable vocalist, Collins went in the studio and attempted to sing "Squonk". His performance was well received by the band, and they decided that he should be their new lead vocalist. Collins then sang on the remaining tracks. "My real worry was actually what to say to the audience, because Peter had always had this offbeat charisma that gave the band a strange aura. I was much more friendly and approachable ... I spent more time ... worrying about what to say between songs than I did about what I was going to do once the songs started." A Trick of the Tail was released in February 1976 and was a commercial and critical success for the band. The album reached No. 3 in the UK and No. 31 in the US. The title track was released as a single, though it did not chart. In June, the album was certified Gold by the British Phonographic Institute for selling over 100,000 copies which helped the band clear the £400,000 of debt (equivalent to £2,827,900 in 2019) they owed when Gabriel left. For the first time in their career Genesis filmed promotional videos for their songs, including "A Trick of the Tail" and "Robbery, Assault and Battery". Before the upcoming tour, Collins sought a drummer he felt comfortable with while singing; he chose Bill Bruford who offered to do the job. From March to July 1976, Genesis performed across North America and Europe with the A Trick of the Tail tour, to enthusiastic crowds. Collins adopted a more humorous rapport with the audience, unlike Gabriel's theatrical approach, which was successful. The shows in Glasgow and Stafford were filmed for their concert film Genesis: In Concert, released in cinemas in February 1977 as a double bill with White Rock. In September 1976, Genesis relocated to Relight Studios in Hilvarenbeek, The Netherlands with Hentschel to record Wind & Wuthering. It was put together in a short amount of time and a considerable amount of material was written beforehand, of which the most suitable songs were picked for development. Rutherford spoke of the band's conscious effort to distance themselves from songs inspired by fantasy, something that their past albums "were full of". The band spent roughly six weeks writing the album with a basic form of each track put down in twelve days. Additional recording and production work was done at Trident Studios that October. Hackett, having already released a solo album, enjoyed the greater amount of control over the recording process that working within a group could not provide. He felt his songs, including "Please Don't Touch" which he later released on his second album Please Don't Touch!, were rejected from the final track order in favour of material that Banks, in particular, had put forward. Collins spoke of the situation, "We just wanted to use what we agreed was the strongest material, irrespective of who wrote it". Wind & Wuthering was released in December 1976 and reached No. 6 the UK and No. 26 in the US. Rutherford's track, "Your Own Special Way", became its sole single and went to No. 43 in the UK. Its B-side is "It's Yourself", originally intended for A Trick of the Tail. Prior to the 1977 tour Bruford declined an offer to return as second drummer, leaving Collins searching for a replacement. He heard American drummer Chester Thompson, of Frank Zappa's band and Weather Report, play a drum passage on "More Trouble Every Day" from Zappa's live album Roxy & Elsewhere. Collins said, "It floored me completely ... I had never met him. I rang him up and said, 'Hi Chester, I've heard your stuff, would you like to play with Genesis?' ... He didn't even audition!" Genesis toured Wind & Wuthering from January to July 1977 across Europe, North America, and for the first time, Brazil. The stage show cost £400,000 (equivalent to £2,441,000 in 2019). which featured a new PA system, lasers and smoke, and lighting supplied from two rows of Boeing 747 aircraft landing lights. Touring began on 1 January with three sold-out shows at the Rainbow Theatre in London, where 80,000 applications were made for the 8,000 available tickets. They returned to London for three nights at Earls Court, then the largest arena in Britain, supported by Richie Havens. The band's growing popularity in North America led to television appearances and concerts organised in larger venues than previous tours, including Madison Square Garden in New York City. Their Brazilian dates were attended by over 150,000 people and a proposed 100,000-person gig was cancelled over rioting fears. An armed bodyguard accompanied each member throughout their stay. In May 1977 Genesis released Spot the Pigeon, an extended play of three tracks left off Wind & Wuthering. It peaked at No. 14 on the UK singles chart. It was the final Genesis release before Hackett left the group. He had been writing more material on his own and found it increasingly difficult to contribute more of his ideas within a group context. He wished to embark on a solo career and "take the risk in order to find out just how good I was on my own". News of Hackett's departure coincided with the band's double live album Seconds Out, recorded in Paris on the A Trick of the Tail and Wind & Wuthering tours and released in October 1977. It reached No. 4 in the UK and No. 47 in the US. By the time Seconds Out was released, Banks, Rutherford, and Collins had already recorded ...And Then There Were Three..., the first Genesis album recorded as a trio, in September 1977 at Relight Studios with Hentschel as producer. It was then mixed at Trident Studios in London. The album is a collection of shorter songs in order to put across more musical ideas. Most of its eleven songs were written individually with Banks contributing four, Rutherford three, Collins one, and the remaining three written collectively. Their new material signalled a change in the band's sound with songs becoming more pop-oriented, including the group-written track "Follow You Follow Me". Collins recalled it was the only song on the album written from scratch during rehearsals. Rutherford felt comfortable taking on lead guitar duties in addition to his usual rhythm and bass roles, although the band had considered auditioning replacement guitarists or using a session guitarist on the album. Collins later saw the album as "a very vocal, solid album" that lacked more rhythmic tracks like "Los Endos" or songs from Wind & Wuthering, as coming up with ideas on the drums while living in his flat in Ealing with his family was difficult. ...And Then There Were Three... was released in March 1978. It received some mixed reviews from critics at the time owing to the album only containing short songs, which excited new fans but disillusioned those who had been used to the band's previous work. Chris Welch wrote a positive review in Melody Maker, citing a "remarkably powerful" album. It was a commercial success and peaked at No. 3 in the UK and No. 14 in the US. "Follow You Follow Me" was released as its lead single and reached No. 7 in the UK and No. 23 in the US, their highest charting single in both countries since their formation. Its success introduced the band to a new audience, including a larger female interest, helped by its music video airing on Top of the Pops. Its success caused some fans to accuse the group of selling out to more commercial music. A follow up single, "Many Too Many", was less successful as it had already appeared on the album. In the search for a new touring guitarist, Rutherford tried out Pat Thrall and Elliot Randall, followed by Alphonso Johnson of Weather Report, but he was primarily a bassist and could not play Hackett's lead guitar parts comfortably. Johnson then suggested American guitarist Daryl Stuermer of Jean-Luc Ponty's jazz fusion group who was more comfortable with various guitar styles. During Stuermer's rehearsal in New York City, Rutherford was satisfied with his performance after they played through "Down and Out" and "Squonk". When Stuermer was chosen, he familiarised himself with a list of 26 songs he was asked to learn by going through five per day. The ...And Then There Were Three... tour ran from March to December 1978 and visited North America, Europe, and for the first time, Japan. It cost an estimated £2 million to stage (equivalent to £11,270,200 in 2019). which included the sound system, light and laser displays, and additional effects from six computer-controlled mirrors, all of which took eight hours to set up and five to dismantle. One of their shows featured a guest appearance from Gabriel, who sang "I Know What I Like (In Your Wardrobe)". In June, Genesis headlined the year's Knebworth Festival, their only UK show that year. In December 1978, Genesis began a period of inactivity as Collins's marriage was at risk of collapse after touring had made him frequently absent from his wife and children. Following a meeting with Banks, Rutherford and Smith, Collins went to Vancouver, British Columbia, Canada, to try and rebuild the family. He explained: "I was never going to leave the band. It was just that if I was going to be living in Vancouver then we'd have had to organise ourselves differently." Banks and Rutherford decided to put Genesis on an extended break and make their respective debut solo albums, A Curious Feeling and Smallcreep's Day, at Polar Studios in Stockholm, Sweden. In April 1979, Collins returned to the UK after his attempt to save his marriage failed. With time to spare before working on a new Genesis album, Collins performed with Brand X and started writing his first solo album, Face Value, at his home in Shalford, Surrey. In 1979, Banks and Rutherford moved into Collins's home in Shalford to write and rehearse material for Duke. The three found the writing process easier and less complicated than And Then There Were Three Rutherford reasoned this as they were "getting back to the basic stage of ideas being worked on jointly". Banks put it down to their break in activity, resulting in "good ideas ... which hasn't happened for some time". Duke continued the band's transition into writing shorter songs with each member contributing two songs for the group to develop. Banks put forward "Heathaze" and "Cul-de-Sac", Rutherford used "Man of Our Times" and "Alone Tonight", and Collins had "Misunderstanding" and "Please Don't Ask". All three wrote the remaining five tracks including "Duchess", the first Genesis song that uses a drum machine, specifically a Roland CR-78 imported from Japan. In its original form, the album was to contain a 30-minute track based on a fictional character named Albert, but the idea was cancelled to avoid comparisons to "Supper's Ready" from Foxtrot. In November, the band recorded Duke at Polar Studios with Hentschel reprising his role as producer, and included a cover from French illustrator Lionel Koechlin, featuring the character Albert. Released in March 1980, Duke was the band's biggest commercial success at the time of release, spending two weeks at No. 1 in the UK and peaking at No. 11 in the US. The album spawned three singles; "Turn It On Again" went to No. 8 in the UK, "Misunderstanding" reached No. 14 in the US, and "Duchess" peaked at No. 46 in the UK. Duke was supported with a UK and North American tour from April to June 1980 which began with a 40-date tour of the UK where all 106,000 tickets were sold within hours of going on sale. In November 1980, Genesis bought Fisher Lane Farm, a farmhouse with an adjoining cowshed near Chiddingfold, Surrey, as their new rehearsal and recording facility. The building was remodelled into a studio in four months before recording for Abacab began in March 1981. The new environment had a productive effect on the writing process as the band wrote enough for a double album, but they discarded one hour's worth of songs that sounded too similar to their past albums. Banks said a conscious effort was made to keep melodies as simple as possible which signalled further changes in their direction. The shift was underlined in its production when Hentschel, their producer and engineer since 1975, was replaced by Hugh Padgham after Collins liked his production on Face Value and Gabriel's third solo album. Production duties were solely credited the band for the first time with Padgham as their engineer. The album is formed of group written material with an individual song from each member. "No Reply at All" features the Phenix Horns, the horn section of American band Earth, Wind & Fire. Abacab was released in September 1981 and reached No. 1 in the UK and No. 7 in the US. Three singles from the album entered the top forty in both countries; "Abacab" reached No. 9 in the UK and No. 26 in the US, "No Reply at All" reached No. 29 in the US, and "Keep It Dark", a European only single, went to No. 33 in the UK. Abacab was supported with a tour of Europe and North America from September to December 1981, ending with shows at Wembley Arena and the NEC Birmingham. The tour marked the band's first use of the Vari-Lite, a computer-controlled intelligent lighting system. Following a demonstration at The Farm, the band and Smith showed an immediate interest in the technology and became shareholders of the company. In May 1982, three tracks recorded during the Abacab sessions – "Paperlate", "You Might Recall", and "Me and Virgil" – were released as an extended play in Europe titled 3×3 which peaked at No. 10 in the UK. Its cover is a homage to the Twist and Shout EP by The Beatles with sleeve notes written by their former publicist Tony Barrow. "Basically, we reached the point ... where we either became a caricature of ourselves and settled into a rut, or we changed. There was no doubt in our minds that change was the answer." In June 1982, Genesis released the double live album Three Sides Live in two different versions. The North American edition contains three sides of live recordings with the fourth comprising the 3×3 tracks and two from the Duke sessions. The European release contains a fourth side of extra live tracks. The album coincided with the home video release of the Three Sides Live concert film recorded in 1981. A tour of North America and Europe followed that ran from August to September 1982, featuring guest appearances from Bill Bruford and the Phenix Horns. On 2 October, Genesis headlined a one-off concert with Gabriel at the Milton Keynes Bowl under the name Six of the Best. The concert was organised to raise money for Gabriel's World of Music, Arts and Dance project which was, by that point, in considerable debt. Hackett, who flew in from abroad, arrived in time to perform the last two songs. Work on the twelfth Genesis album, Genesis, began in March 1983 with Padgham returning as engineer. It is the first album written, recorded, and mixed at the remodelled studio at The Farm. Banks remembered the band were scarce for new musical ideas which "felt at times as though we were stretching the material as far as we could". "Mama" concerns a man's obsession with a prostitute at a Cuban brothel. It originated from a beat Rutherford came up with on a LinnDrum machine that was fed through his guitar amplifier and an echo gate. Collins' laugh on the track originated from "The Message" by Grandmaster Flash and the Furious Five. Released in October 1983, Genesis went to No. 1 in the UK and peaked at No. 9 in the US, where it reached Platinum by December that year and went on to sell over four million copies. Three tracks were released as singles; "Mama" reached No. 4 in the UK, their highest charting UK single to date, and "That's All" reached No. 6 in the US The Mama Tour ran from late 1983 through to 1984, covering North America and five UK shows in Birmingham. The latter shows were filmed and released as Genesis Live – The Mama Tour. In February 1984, Genesis took a break in activity to allow each member to continue with their solo careers. 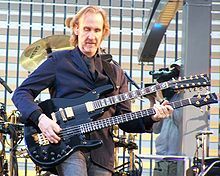 Rutherford formed his group Mike + The Mechanics, Banks worked on his solo album Soundtracks, and Collins released No Jacket Required which achieved worldwide success and increased his popularity as a result. The music press took note that Collins' success as a solo artist made him more popular than Genesis. Before the release of No Jacket Required, Collins insisted that he would not leave the band. "The next one to leave the band will finish it," Collins told Rolling Stone magazine in May 1985. "I feel happier with what we're doing now, because I feel it's closer to me. I won't be the one." Collins added, "Poor old Genesis does get in the way sometimes. I still won't leave the group, but I imagine it will end by mutual consent." In June, Collins spoke of the band's intention to start work on a new album that year, ending rumours to a false announcement that aired on BBC Radio 1 suggesting Genesis had split. Genesis reconvened at The Farm in October 1985 to start work on Invisible Touch which lasted for six months. They continued their method of songwriting used on Genesis by developing material from group improvisations. Banks remembered the time as a strong period creatively for the band, with ideas "flowing out of us". "Invisible Touch" was developed in such a way, when the group were working on "The Last Domino", the second part of "Domino". During the session, Rutherford began to play an improvised guitar riff to which Collins replied with an off-the-cuff lyric – "She seems to have an invisible touch" – which became the song's chorus hook. Following its release in June 1986, the album spent three weeks at No. 1 in the UK and reached No. 3 in the US. Despite the mixed reviews, Invisible Touch was a commercial success, becoming the best selling Genesis album in the US, selling over 6 million copies there. The album's five singles – "Invisible Touch", "Throwing It All Away", "Land of Confusion", "In Too Deep", and "Tonight, Tonight, Tonight" – entered the top five on the US singles chart between 1986 and 1987 with "Invisible Touch" topping the chart for one week. Genesis became the first group and foreign act to achieve this feat, equalling the five singles record set by Michael Jackson, Janet Jackson, and Madonna. Genesis commissioned the creators of the satirical British television show Spitting Image, Peter Fluck and Roger Law, to make puppets of them in the style of the show for the video of "Land of Confusion". "Nearly 300,000 people at Wembley ... I thought at the time, and I still think now, that moment was the peak of our career." The Invisible Touch Tour was the band's largest world tour in its history which included 112 dates from September 1986 to July 1987. Genesis received some criticism in their decision to have Michelob beer as a sponsor. The tour concluded with four consecutive sold-out shows at Wembley Stadium in London. The shows were released in 1988 as The Invisible Touch Tour. When the tour ended, Genesis took a five-year break while each member committed to their solo projects. They performed twice during this time; on 14 May 1988, they performed a 20-minute set at the Atlantic Records 40th Anniversary concert at Madison Square Garden. This was followed by a set at a charity gig at the 1990 Knebworth Festival in June, headlined by Pink Floyd. In 1991 Genesis recorded their fourteenth album, We Can't Dance, from March to September with their new engineer and co-producer, Nick Davis. The band took advantage of the increased capacity the CD offered and released over 71 minutes of new music across 12 tracks. Collins wrote the lyrics to "Since I Lost You" for his friend Eric Clapton following the death of Clapton's four-year-old son Conor. Following the release of We Can't Dance in November 1991, the album went to No. 1 in the UK for one week and No. 4 in the US, where it went on to sell over 4 million copies. The album spawned several hit singles; "No Son of Mine" went to No. 6 in the UK and "I Can't Dance" reached No. 7 in the UK and the US. In 1993, We Can't Dance was nominated for a Brit Award for Best British Album. Genesis performing at the Knebworth Festival in August 1992. The We Can't Dance tour visited North America and Europe from May to November 1992 with each concert attended by an average of 56,000 people. The tour spawned two live albums; The Way We Walk, Volume One: The Shorts reached No. 3 in the UK and The Way We Walk, Volume Two: The Longs went to No. 1 in the UK. Following the tour, the band took a break in activity. Banks, Rutherford, and Collins performed at Cowdray Castle, Midhurst in September 1993 for a money-raising event with Pink Floyd touring guitarist Tim Renwick and drummer Gary Wallis and Queen drummer Roger Taylor. Rutherford also played bass on Pink Floyd's set at the same concert. In March 1996, Collins announced his departure from Genesis. In a statement, he said, "Having been in Genesis for 25 years, I felt it time to change direction in my musical life. For me now, it will be music for movies, some jazz projects, and of course my solo career. I wish the guys in Genesis all the very best in their future. We remain the best of friends." Shortly after Banks and Rutherford decided to continue Genesis in 1996, they went to The Farm to start writing Calling All Stations. Rutherford initially found the sessions difficult as he saw Collins as "the guy in the middle" who made Banks and himself work better. Their best ideas developed in this period were put forward while they auditioned new singers, including Francis Dunnery and Nick Van Eede. The two main contenders, David Longdon (later of Big Big Train) and Scottish singer Ray Wilson of Stiltskin, auditioned throughout 1996 which involved singing along to Genesis tracks with the lead vocals removed. Wilson was announced as the new Genesis singer in June 1997. Though much of the album was already written by the time he joined, Banks was pleased with his contributions to the album which included writing the lyrics to "Small Talk" and riffs on "Not About Us" and "There Must Be Some Other Way". Banks and Rutherford opted for two drummers on Calling All Stations – Israeli session musician Nir Zidkyahu and Nick D'Virgilio of Spock's Beard. Calling All Stations was released in September 1997. It was a success in Europe, where it reached No. 2 in the UK, but the album peaked at No. 54 in the US, their lowest charting album there since Selling England by the Pound. A single from the album, "Congo" reached the top 30 in the UK and Genesis completed a European tour from January to May 1998, adding Zidkyahu on drums and Irish guitarist Anthony Drennan. A North American tour was planned but was cancelled following its poor commercial response and lack of ticket sales, which led to Banks and Rutherford announcing in 2000 that the group would no longer be recording and touring. In 1998, Banks, Collins, Gabriel, Hackett, Phillips, Rutherford, and Silver gathered for a photo session and dinner to celebrate the release of the four-disc box set, Genesis Archive 1967–75. The set features "Supper's Ready" and "It" with new overdubs by Gabriel and Hackett. In 1999, Banks, Collins, Rutherford, Hackett, and Gabriel released a new version of "The Carpet Crawlers" for the compilation album Turn It On Again: The Hits. On 21 September 2000, Collins, Banks, Rutherford reunited at the Music Managers Forum, in honour of their manager Tony Smith. Gabriel attended the ceremony but chose not to perform. Genesis briefly performed at Gabriel's wedding in 2002. In 2004, Genesis released Platinum Collection, a three-disc box set of songs covering the band's career that reached No. 21 in the UK. In a press conference held in London in November 2006, Banks, Rutherford, and Collins announced their reunion for the Turn It On Again Tour, their first with Collins in fourteen years. They revealed the initial plan of touring The Lamb Lies Down on Broadway with Gabriel and Hackett. The five met in Glasgow in November 2004 to discuss the idea further, but it never developed further as Gabriel was unable to commit due to other projects. Instead, Banks, Rutherford and Collins decided to proceed with Thompson and Stuermer returning on drums and guitar, respectively. In March 2007, a press conference was held in New York City to announce the North American leg. The Turn It On Again Tour featured a stage designed by architect Mark Fisher with a lighting display by Patrick Woodroffe, included a 55-metre long LED backdrop formed of 9 million LED lights. The European leg saw close to 400,000 tickets sold in 40 minutes for shows in Germany and the Netherlands. 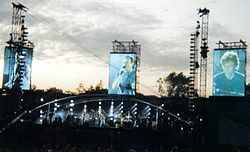 The European leg ended with a free concert on 14 July at the Circus Maximus in Rome in front of around half a million people. It was filmed for DVD that was released the following year as When in Rome 2007. A live album formed of recordings from various European dates was released in 2007 as Live over Europe 2007. On 7 July, the band played at the Live Earth concert in London at Wembley Stadium. In 2007, the band's studio albums from Trespass to Calling All Stations were digitally remastered by Nick Davis across three box sets: Genesis 1970–1975, Genesis 1976–1982 and Genesis 1983–1998. Each album is presented as a two-disc set containing a CD/Super Audio CD of a new stereo mix and a DVD with a 5.1 surround sound mix and bonus features including previously unreleased live performances, interviews, and concert programs. Two DVD box sets followed, Genesis Live 1973–2007 and Genesis Movie Box 1981–2007, in 2009. Since 2011, Genesis have expressed mixed opinions about a reunion. Collins retired from the music industry as an active musician that year in favour of family commitments and has stated he can no longer play the drums due to medical issues. Hackett has said "I would say it's possible, but highly improbable. I've always been open to it. I'm not the guy who says no." Gabriel addressed the possibility of a reunion: "I never say never. It really didn't happen last time. I think there's a small chance, but I don't think it's very high." In 2014, Collins reiterated, "Have people thought it through? It’s not as if you’re going to get Peter as the singer, me as the drummer. I can’t play any more, so it’s never going to happen," adding it would not be likely for Gabriel to perform songs Collins originally sang lead on. In 2014 Gabriel, Banks, Rutherford, Collins and Hackett reunited for Genesis: Together and Apart, a BBC documentary about the band's history and the various solo albums the members have released. Although he participated in the documentary and promoted it, Hackett was critical following its broadcast, saying that it was biased and did not give him editorial involvement, adding that it ignored his solo work despite him speaking at length about it. The documentary does not feature Wilson's time in Genesis. Hackett remains cynical about a Genesis reunion, saying: "Look at the documentary and you'll get an idea of the priorities that come across." In 2015, Collins announced an end to his retirement, and speculated a reunion with Banks and Rutherford would be possible, a view which Banks endorsed. In 2017, Rutherford said he was also amenable to a reunion tour if Collins was interested. Hackett said he would like a reunion of the 1971–1975 line-up, but stressed it was very unlikely, adding "I won’t say any more because I don’t want to raise expectations". Collins published his autobiography in 2016, and stated in the introduction that he retired from Genesis in 2007. Genesis identify first and foremost as songwriters. Any instruments featured on any of the recordings were used because they helped serve the song. Rutherford later said "We're much more concerned with feel." Though styles changed dramatically over the group's career, they were always built on musical contrasts and the willingness to experiment. Members of the original line-up were exposed to classical and church music as well as rock artists of the 1960s, particularly the Beatles. Gabriel's vocal style was influenced by Otis Redding and other Stax artists. Some of Genesis's music was inspired by blues according to Hackett, who says that the sonic innovation of the electric guitar in the early 1970s came straight from this. In their early years, Genesis' music combined elements of the pop, folk, and psychedelic genres. Several songs developed during Phillips' time in the band originated on 12-string guitars, often with unconventional tunings. By the 1970s, the group began to include fantasy and surreal elements in their lyrics, such as "The Musical Box". Nursery Cryme marks the first time electric instruments were used more extensively. A Trick of the Tail marked a return to the band's roots with acoustic passages and songs inspired by fantasy. Early lyrics drew from psychedelia, fantasy, mythological figures, and fairytale themes. Gabriel emerged as one of the band's main lyricists who often incorporated puns and double entendres in his lines and track titles and addressed various themes including social commentary. Selling England by the Pound contains references to English culture of the time including "Aisle of Plenty", where four British supermarket chains are referenced to reflect the album's theme of commercialism. Literary sources are used as inspiration for many Genesis tracks; "The Cinema Show" is based on T. S. Eliot's poem The Waste Land, and Arthur C. Clarke's novel Childhood's End inspired the lyrics to "Watcher of the Skies". Mike Rutherford playing his distinctive double neck guitar, combining 12-string and bass. By the time the group had slimmed down to the trio of Banks, Rutherford and Collins, they had decided to change lyrical styles, dealing more with everyday matters which connected with female fans. Collins' songs, in particular, were personal in nature. However, the group still featured humour in songs such as "Illegal Alien", and dealt with serious themes such as politics on "Land of Confusion" and commercialisation on "I Can't Dance". Banks has said that a common way of developing songs throughout the band's career was for Collins to play the rhythm, Rutherford to set up a groove and riffs, and for him to add the harmonies and melodies on top. He cites the "Apocalypse in 9/8" section of "Supper's Ready", "The Cinema Show" and "Domino" as examples of this, and says the restrictions it gave him allowed the group to produce straightforward pop songs such as "Invisible Touch" and "Land of Confusion" in later years. Banks used a number of keyboards during Genesis' career, continually trying out new models, though he used the piano regularly throughout the group's lifetime. In the 1970s, he frequently used the Hammond organ, Hohner Pianet, Mellotron, RMI Electronic Piano and ARP Pro Soloist. In the 1980s, he used the Sequential Circuits Prophet 5 and Prophet 10, the ARP Quadra and various Korg synthesizers. For the Turn It On Again tour in 2007, his main board was a Korg Oasys. As both a guitarist and bassist, Rutherford regularly swapped between the two roles, and his trademark instrument with Genesis, particularly through the 1970s, was a double neck guitar. In the 1980s and beyond, he favoured the Eric Clapton Stratocaster. "Genesis has had a hard time getting respect. In the early '70s ... it attracted an avid cult following but was largely ignored by the rock press and public at large ... Even in the early '80s ... the press was unimpressed, dismissing the group as easy-listening lightweights ... All of which, to be honest, has been grossly unfair to the group." Genesis have been estimated to have sold between 100–150 million albums worldwide. Their total certified album sales include 21.5 million in the US, 7.2 million in the UK, 5.6 million in Germany, and 3.4 million in France. Genesis have been awarded with eleven Gold and four Multi-Platinum albums in the UK, while in the US they have seven Gold, two Platinum, and four Multi-Platinum albums. In March 2010, Genesis were inducted into the Rock and Roll Hall of Fame by Phish guitarist Trey Anastasio. The band's awards include a Silver Clef Award for outstanding contributions to British music at its second annual ceremony in 1977. In 1988, the band received one of the only two Grammy Awards issued for the short-lived Best Concept Music Video category for "Land of Confusion". In September 2012, a Lifetime Achievement Award was given to the band at the inaugural Progressive Music Awards. In 2004, Q ranked Genesis as the seventeenth-biggest band in a list compiled based on album sales, time spent on the UK charts, and largest audience for a headlining show. Genesis were honoured at the second VH1 Rock Honors in May 2007, which featured Banks, Rutherford and Collins. In 2008, the band received a Lifetime Achievement Award at the Mojo Awards in 2008. Genesis were targets for criticism throughout the 1970s from those who disliked progressive rock. Influential BBC DJ John Peel championed the band in their early years and they performed three sessions for him between 1970 and 1972, but he "grew disillusioned with their later excesses". Some regarded the group as overtly middle class, paying particular attention to the founder members' private education, and claimed rock music was being taken away from the working class, whom they regarded as its core audience. Likening his background to that of the punk artist Joe Strummer, who had become a "people's hero" musician, Gabriel stated in 2013, "To this day, we've never outgrown the snotty rich-kid thing ... we were always very straight about where we came from, and we were middle-class, not aristocratic". Gabriel's theatrics were unpalatable to some of the mainstream rock audience, resulting in a cult following rather than that of a mainstream rock band. At their commercial peak in the 1980s, the music of Genesis faced the accusation of being "flabbergastingly insignificant" by leading American music critic Robert Hilburn, and it has been described as "barely distinguishable" from Collins's solo work. According to Rolling Stone's Erik Hedegaard, Collins in particular was blamed by those who accused the band of selling out. Retrospectively, The New Rolling Stone Album Guide critic J. D. Considine documented how the band had been "largely ignored" by the music press and public in their earliest years, before being "derided as middlebrow throwbacks still in thrall to the pomposities of art rock" in the late 1970s and then dismissed as "easy-listening lightweights" in the 1980s. He argued this was unfair, as the band had made their "share of mediocre albums" but no bad ones. Critics, though, disagree about which albums were mediocre; Considine cites Selling England by the Pound as one of the band's three worst (those meriting 2 stars out of 5), while the AllMusic Guide picks it is one of their three best. The other two AllMusic picks, The Lamb Lies Down on Broadway and Abacab, are not among Considine's favourites, either, his preferring Duke and Genesis. Q reviewer Andy Fyfe wrote in 2007 that "little of the band's output has aged well" and "transcends in the way real classics do", suggesting they would "remain perennial whipping boys for decades to come". However, The Daily Telegraph chief rock music critic Neil McCormick has said that Genesis were "a daring and groundbreaking band (certainly in their early career)", described Collins as "an outstanding drummer" and stated that "after Gabriel left, he stepped up to prove himself a charismatic frontman with a very distinctive vocal character". Journalists have reported that fans preferring one era of the band strongly dislike others. Rock author Colin McGuire has described the arguments from fans of the Gabriel era as "they sold out and became too corporate when Collins stepped into the spotlight", while fans of the Collins era argue "the Gabriel years were boring and hard to stomach". He concluded both eras of the band should be judged on their own merits. The band themselves have been aware of these divides; press interviews for Abacab explicitly stated that fans of Foxtrot might not like the album, but should keep an open mind. Genesis have been cited as a principal influence on the neo-progressive rock subgenre that emerged in the 1980s, featuring bands including Marillion and Pallas. Steve Hackett's work in Genesis influenced guitarists such as Brian May of Queen, Alex Lifeson of Rush, and Eddie Van Halen of Van Halen. Iron Maiden founder Steve Harris cites Gabriel-era Genesis as one of his main influences, stating "Supper's Ready" as his joint all-time favourite song in an interview with Prog. Genesis were also an influence on post-punk artists such as Simple Minds and Will Sergeant, guitarist of Echo & the Bunnymen, as well as the electronic new wave band The Human League. Trey Anastasio of Phish said "It's impossible to overstate what impact this band and musical philosophy had on me as a young musician. I'm forever in their debt." Mostly Autumn "fuse the music of Genesis and Pink Floyd" in their sound. The alternative rock band Elbow acknowledge Genesis as an influence, such as on their breakthrough song "Newborn". There are a number of Genesis tribute bands, including ReGenesis who focus on the group's 1970s repertoire, and Mama, who cover all eras of the band. The most successful act has been the Canadian-French band The Musical Box that have been officially endorsed by the band and had Hackett and Collins perform as guests with them. Gabriel has taken his children to see the Musical Box, so "they could see what their father did back then", while Hackett has said "They not only manage to sound, but look virtually identical". ^ a b Buckley 2003, p. 422. ^ a b Bowler & Dray 1992, p. x. ^ a b Bowler & Dray 1992, p. 13. ^ a b c Welch 2011, p. 125. ^ a b Collins 2016, p. xiii. ^ a b c d e f g Frame 1983, p. 23. ^ Bowler & Dray 1992, p. 14. ^ Bowler & Dray 1992, p. 15. ^ Welch 2011, p. 11. ^ Platts 2001, pp. 11–12. ^ Bowler & Dray 1992, p. 16. ^ Bowler & Dray 1992, p. 17. ^ a b c d e Genesis 2007, p. 348. ^ a b Hewitt 2001, p. 25. ^ a b Bowler & Dray 1992, p. 19. ^ Bowler & Dray 1992, pp. 21–22. ^ Bowler & Dray 1992, p. 20. ^ Bowler & Dray 1992, p. 21. ^ Genesis 2007, p. 52. ^ King, Jonathan. In the Beginning, From Genesis to Revelation (sleeve notes). 1993 release. ^ a b c d e f g h i j k l m n o "Genesis: Awards". AllMusic. Retrieved 23 September 2015. ^ Bowler & Dray 1992, p. 22. ^ Bowler & Dray 1992, pp. 23–24. ^ Platts 2001, p. 19. ^ Bowler & Dray 1992, pp. 23, 27. ^ Perrone, Pierre (20 April 2009). "John Mayhew: Drummer who played with the fledgling Genesis on 'Trespass'". The Independent. Retrieved 15 September 2015. ^ Genesis 2007, p. 49. ^ Bowler & Dray 1992, p. 28. ^ Platts 2001, p. 20. ^ a b Hewitt 2001, p. 27. ^ Genesis 2007, p. 74. ^ Genesis 2007, p. 71. ^ Genesis 2007, p. 72. ^ a b c d e f g h i Genesis 2007, p. 349. ^ Bowler & Dray 1992, p. 27. ^ Bowler & Dray 1992, p. 31. ^ Bowler & Dray 1992, pp. 32–33. ^ Romano 2010, p. 72. ^ Platts 2001, p. 50. ^ a b c d e f g h i j k l m "GENESIS". Official Charts. Retrieved 20 September 2015. ^ Fletcher, Gordon (1 August 1974). "Genesis: Trespass : Music Reviews". Rolling Stone. Archived from the original on 2 May 2008. ^ Blake, Mark (December 2011). "Cash for questions: Peter Gabriel". Q. p. 46. ^ a b Bowler & Dray 1992, p. 35. ^ Bowler & Dray 1992, pp. 29,31. ^ Bowler & Dray 1992, p. 34. ^ Genesis 2007, pp. 92–93. ^ "Queen 40th anniversary: 10 things you never knew". The Daily Telegraph. 24 September 2011. Retrieved 27 August 2015. ^ a b Genesis 2007, p. 94. ^ a b Genesis 2007, p. 95. ^ Genesis 2007, p. 96. ^ Rutherford 2015, p. 94. ^ Bowler & Dray 1992, p. 41. ^ a b Bowler & Dray 1992, p. 43. ^ Genesis 2007, p. 101. ^ Bowler & Dray 1992, p. 44. ^ Genesis 2007, p. 103. ^ Hewitt 2001, p. 32. ^ Platts 2001, p. 42. ^ Genesis 2007, pp. 105–106. ^ Platts 2001, p. 43. ^ Bowler & Dray 1992, p. 53. ^ Macan 1997, pp. 60–61. ^ Bowler & Dray 1992, p. 59. ^ Hewitt 2001, p. 33. ^ Platts 2001, p. 44. ^ "Report on the Reading Festival: Genesis". Melody Maker. 26 August 1972. ^ Bowler & Dray 1992, pp. 61,249. ^ Bowler & Dray 1992, p. 62. ^ Platts 2001, p. 54. ^ Bowler & Dray 1992, p. 65-66. ^ Bowler & Dray 1992, p. 67. ^ Bowler & Dray 1992, p. 69. ^ "Advert – Genesis – Foxtrot album – Melody Maker – 14th Oct". Melody Maker. 14 October 1972. p. 23. Retrieved 30 November 2014. ^ Erlewine, Stephen Thomas. "Foxtrot – Genesis". AllMusic. ^ Genesis 2007, p. 113. ^ Platts 2001, p. 59. ^ Welch, Chris (23 December 1972). "Genesis: A fun time in NYC". Melody Maker. pp. 8, 9. Retrieved 15 September 2015. ^ Genesis 2007, p. 133. ^ Bowler & Dray 1992, pp. 74–75. ^ Genesis 2007, p. 148. ^ Genesis 2007, p. 141. ^ Genesis 2007, p. 143. ^ Bowler & Dray 1992, p. 80. ^ Bowler & Dray 1992, p. 81. ^ Bowler & Dray 1992, p. 82. ^ Genesis 2007, p. 164. ^ Genesis 2007, p. 111. ^ Genesis 2007, p. 145. ^ Rutherford 2015, p. 120. ^ Platts 2001, p. 74. ^ Welch, Chris. Genesis: The Lamb Lies Down On Broadway. Melody Maker, 23 November. 1974. ^ Genesis 2007, p. 157. ^ Rutherford 2015, p. 122. ^ Platts 2001, p. 75. ^ "Glaspant Retreats Gallery". Archived from the original on 20 October 2016. Retrieved 30 December 2016. ^ Thompson 2005, p. 117. ^ "Genesis's Tony Banks and Mike Rutherford Talk To Uncut!". Uncut. Retrieved 12 January 2015. ^ Bowler & Dray 1992, p. 246. ^ Neer, Dan (1985). Mike on Mike [interview LP], Atlantic Recording Corporation. ^ Bowler & Dray 1992, p. 100. ^ Platts 2001, p. 95. ^ Bowler & Dray 1992, p. 93. ^ a b Genesis 2007, p. 158. ^ Bowler & Dray 1992, p. 107. ^ Bowler & Dray 1992, p. 108. ^ Bowler & Dray 1992, p. 111. ^ a b Rutherford 2015, p. 139. ^ Rutherford 2015, p. 137. ^ Bowler & Dray 1992, p. 112. ^ Bowler & Dray 1992, p. 118. ^ Genesis 2007, pp. 170. ^ Bowler & Dray 1992, p. 247. ^ a b c d Bowler & Dray 1992, p. 249. ^ a b "Certified Awards". BPI. Select keyword "Genesis", By award : Gold, By Format : Album, navigate to page 3. Archived from the original on 15 March 2015. Retrieved 3 April 2015. ^ Zammitt, David (16 November 2014). "Beyond the Stool: Drummers in the Spotlight". DIY Magazine. Retrieved 13 April 2015. ^ "See Mike Rutherford's Career From Genesis to the Mechanics in 13 Videos". Rolling Stone. 5 February 2015. Retrieved 14 September 2015. ^ Bowler & Dray 1992, pp. 122. ^ Bowler & Dray 1992, p. 134. ^ Bowler & Dray 1992, p. 128. ^ a b Frischvers, Richard (31 March 1977). "Wind and Wuthering". Circus. pp. 58–60. ^ Welch, Chris (25 December 1976). "Wuthering heights". Melody Maker. p. 14. ^ a b "Genesis – Wind and Wuthering – press kit – Atlantic Records". Atlantic Records. 1977. Archived from the original on 8 April 2015. Retrieved 28 April 2015. ^ a b Bowler & Dray 1992, pp. 128–129. ^ a b c d e Genesis 2007, p. 350. ^ Hewitt 2001, p. 75. ^ Bowler & Dray 1992, p. 133. ^ Salewicz, Chris (2 July 1977). "It Helps You Make It on the Night". New Musical Express. p. 14. Retrieved 20 September 2015. ^ a b "Genesis: The Earl's Court Supergig and Mike Rutherford Interviewed". Beat Instrumental. August 1977. pp. 4–6, 49. Retrieved 20 September 2015. ^ Bowler & Dray 1992, p. 132. ^ "Brazil goes nuts for Genesis". Sounds. 28 May 1977. ^ a b Bowler & Dray 1992, p. 144. ^ Bowler & Dray 1992, p. 147. ^ Bowler & Dray 1992, pp. 143–144. ^ a b Bowler & Dray 1992, p. 148. ^ Dallas, Karl (11 November 1978). "Genesis: A Return to the Roots". Melody Maker. p. 36. Retrieved 20 September 2015. ^ Bowler & Dray 1992, pp. 148–9. ^ Welch, Chris (1 April 1978). "Genesis: Tricks and Treats". Melody Maker. Retrieved 20 September 2015. ^ Bowler & Dray 1992, pp. 148,249. ^ a b Bowler & Dray 1992, p. 149. ^ a b Bowler & Dray 1992, p. 150. ^ Prasad, Anil (2007). "Genesis – Turning it on again". Innerviews. Retrieved 19 September 2018. ^ a b c Bowler & Dray 1992, p. 151. ^ Genesis 2007, p. 229. ^ a b c d e f Fielder, Hugh (27 October 1979). "The return of... Getting it together in the Country". Sounds. Retrieved 11 October 2014. ^ Fielder, Hugh (22 April 1978). "The Shocking Truth About Genesis in America". Sounds. Retrieved 20 September 2015. ^ Greene, Andy (23 July 2013). "Flashback: Peter Gabriel Revives a Genesis Classic in 1978". Rolling Stone. Retrieved 3 November 2015. ^ Bowler & Dray 1992, pp. 154–155. ^ Bowler & Dray 1992, p. 164. ^ Gett, Steve. "Genesis : Civil Hall, Guildford". Archived from the original on 31 August 2015. Retrieved 17 April 2015. ^ Koechlin, Lionel (1979). L'Alphabet d'Albert. Jannick. ISBN 978-2-902-46204-9. 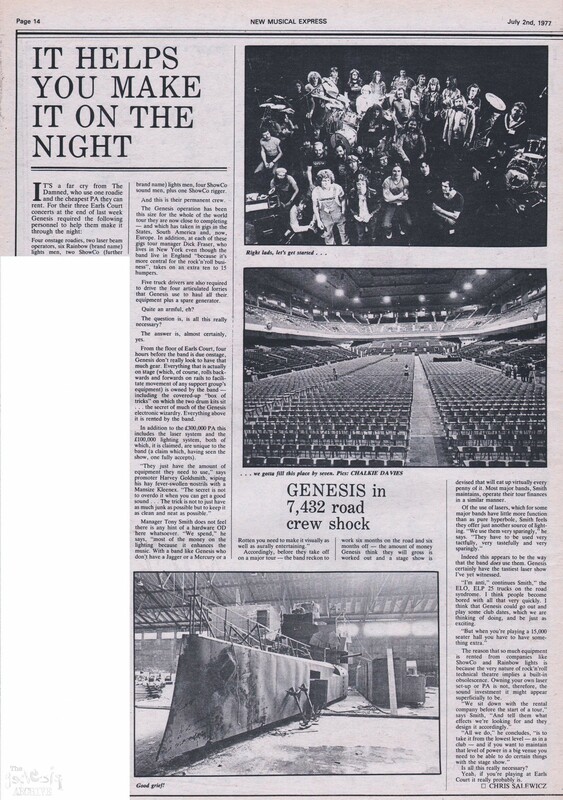 ^ "Genesis: Another London Concert". NME. 8 February 1980. ^ Genesis 2007, p. 238. ^ Bowler & Dray 1992, p. 170. ^ Flans, Robyn (1 May 2005). "Classic Tracks: Phil Collins' In the Air Tonight". Mix. Archived from the original on 17 March 2007. Retrieved 25 March 2007. ^ Bowler & Dray 1992, p. 171. ^ Bowler & Dray 1992, p. 175. ^ a b Bowler & Dray 1992, p. 248. ^ Bowler & Dray 1992, p. 176. ^ "Genesis of the Moving Beam". Total Production International. No. 128. April 2010. Archived from the original on 12 July 2011. ^ Bowler & Dray 1992, p. 178. ^ Griffin, John (28 August 1982). "Genesis in orbit with new image and album topping Top Twenty". The Montreal Gazette. p. E-2. Retrieved 9 October 2015. ^ a b Bowler & Dray 1992, p. 179. ^ Bowler & Dray 1992, p. 182. ^ Bowler & Dray 1992, p. 186. ^ a b Genesis 2007, p. 263. ^ Bowler & Dray 1992, p. 187. ^ Bowler & Dray 1992, p. 188. ^ Bowler & Dray 1992, pp. 191,251. ^ Bowler & Dray 1992, p. 190. ^ Hinkley, David (30 June 1985). "Rock's Little Drummer Boy Goes Pop". New York Daily News Magazine. p. 6. ^ Bowler & Dray 1992, p. 198. ^ Platts 2001, p. 142. ^ Genesis 2007, p. 282. ^ a b Bowler & Dray 1992, p. 202. ^ "The Hot 100 – 1986 Archive". Billboard. Retrieved 1 October 2015. ^ Grien, Paul (13 June 1987). "Chart Beat: Genesis Joins Five-Top-Five-Hits Club; Walden Produces His Sixth In Two Years" (PDF). Billboard. p. 6. Retrieved 4 October 2015. ^ "Peter Gabriel, 'Sledgehammer' (1986) – The 30 All-TIME Best Music Videos". Time. Retrieved 23 October 2012. ^ Genesis 2007, p. 287. ^ a b Platts 2001, p. 143. ^ Bowler & Dray 1992, p. 214. ^ Bowler & Dray 1992, pp. 219–221. ^ "Genesis". The BRIT Awards. Archived from the original on 24 October 2014. Retrieved 10 November 2012. ^ Hewitt 2001, p. 63. ^ Povey, Glenn (2007). Echoes : The Complete History of Pink Floyd. 3C Publishing. p. 257. ISBN 978-0-95546-241-2. ^ Darling, Linda; Silberstein, Scott (28 March 1996). "Phil Quits Genesis!". Entertainment Wire. Archived from the original on 11 March 2007. Retrieved 23 March 2007. ^ Genesis 2007, p. 310. ^ "David Longdon exclusive interview for 'Dusk' – November 2010". Dusk.it. Retrieved 21 December 2014. ^ Genesis 2007, p. 315. ^ "Dotmusic Talent: GENESIS". Dotmusic.co.uk. Archived from the original on 8 July 1998. Retrieved 21 December 2014. ^ Everett 2008, p. 339. ^ "Turn It On Again : The Hits". AllMusic. Retrieved 9 October 2015. ^ "Celebrity Gossip and Entertainment News – VH1 Celebrity". VH1. Archived from the original on 8 August 2007. Retrieved 21 December 2014. ^ "Genesis Brings Old Friends Back Together". Washington Post. Retrieved 14 August 2018. ^ Erlewine, Stephen Thomas. "Genesis : Platinum Collection". AllMusic. Retrieved 30 November 2015. ^ Masters, Tim (7 November 2006). "Genesis reunion 'not about money'". BBC News. Retrieved 18 September 2015. ^ a b Greene, Andy (22 October 2012). "Steve Hackett Revisits Genesis Catalog, Says Reunion Is 'Highly Improbable'". Rolling Stone. Retrieved 15 September 2015. ^ a b "14 Genesis Albums Coming to 5.1 Super Audio CD Surround Sound". High Fidelity Review. Retrieved 30 November 2015. ^ Bychawski, Adam (7 March 2007). "Genesis announce North American reunion dates". NME. Retrieved 18 September 2015. ^ "Genesis concert backdrop uses 9 million LEDs". LEDs Magazine. July 2007. Retrieved 18 September 2015. ^ "Genesis UK comeback gigs sell out". BBC News. 24 November 2006. Retrieved 18 September 2015. ^ "Genesis to play free Rome concert". BBC News. 9 February 2007. Retrieved 18 September 2015. ^ "When in Rome, hit our top 10 tourist sights". American Statesman. 3 October 2015. Archived from the original on 8 December 2015. Retrieved 1 December 2015. ^ "Live Over Europe / When In Rome". AllMusic. Retrieved 9 October 2015. ^ Walsh, Bryan (8 July 2007). "What Live Earth Really Meant". Time. Retrieved 30 November 2015. ^ "Live 1973 – 2007 : Genesis". AllMusic. Retrieved 9 October 2015. ^ "Genesis : The Movie Box". AllMusic. Retrieved 9 October 2015. ^ "Latest Music News, Band, artist, Musician & Music Video News". Billboard. Retrieved 21 July 2011. ^ "Peter Gabriel on Genesis Reunion". Rolling Stone. 14 April 2014. ^ "Genesis Interviews". Uncut. 10 September 2015. Retrieved 9 October 2015. ^ Kreps, Daniel (5 October 2014). "Genesis Guitarist Steve Hackett Blasts 'Biased' Documentary". Rolling Stone. Retrieved 14 October 2014. ^ DeRiso, Nick (29 January 2015). "Steve Hackett Says Genesis Documentary Doomed Reunion". Ultimate Classic Rock. Retrieved 19 August 2015. ^ Kaye, Ben (28 October 2015). "Phil Collins returns: "I am no longer retired"". Consequence of Sound. Retrieved 9 November 2015. ^ "Tony Banks wants a Genesis reunion". Tv3. 4 September 2015. Retrieved 9 November 2015. ^ "Genesis open to the idea of reuniting for their 50th anniversary". Planet Rock. 24 April 2017. Retrieved 16 February 2018. ^ Bowler & Dray 1992, p. 224. ^ Bowler & Dray 1992, pp. 6–7,9. ^ Bowler & Dray 1992, p. 9. ^ "The classic era of Genesis examined: 1971–1975". Goldmine. Retrieved 7 August 2018. ^ Eder, Bruce. "Genesis – Artist Biography". AllMusic. Retrieved 2 August 2015. ^ Hegarty & Halliwell 2011, pp. 58–61. ^ Bowler & Dray 1992, p. 120. ^ Martin 2002, p. 71. ^ Hegarty & Halliwell 2011, p. 96,126. ^ Bowler & Dray 1992, pp. 161–162. ^ Bowler & Dray 1992, p. 189. ^ Bowler & Dray 1992, p. 203. ^ Bowler & Dray 1992, p. 221. ^ Reed, Ryan (28 July 2015). "Genesis' Tony Banks Talks Elusive Solo Success, New Box Set". Rolling Stone. Retrieved 8 October 2015. ^ "ReGenesis : Early Genesis for the modern keyboardist". Sound on Sound. April 2009. Retrieved 13 December 2012. ^ Reid, Gordon (March 1999). "Sequential CircuitsProphet Synthesizers 5 & 10 (Retro)". Sound on Sound. Retrieved 9 October 2015. ^ "Korg Oasys: On Tour with Tony Banks and Genesis". Digital Village. Retrieved 8 October 2015. ^ "Mike Rutherford on Genesis". Guitar Player. 1 August 2007. Retrieved 8 October 2015. ^ a b c Nathan Brackett; Christian Hoard, eds. (2004). The New Rolling Stone Album Guide. Simon & Schuster Ltd. p. 328. ISBN 978-0743201698. ^ Conroy, Rick (7 November 2014). "God Bless You, Phil Collins". Wellington Times. Retrieved 13 November 2014. ^ McLean, Craig (30 September 2014). "Genesis interview: 'We were hated'". The Daily Telegraph. Retrieved 1 December 2015. ^ Lee, Marc (2 June 2008). "Final chapter in the book of Genesis?". The Telegraph. Retrieved 24 July 2016. ^ Moskowitz, David V. The 100 Greatest Bands of All Time: A Guide to the Legends Who Rocked the World. ABC-CLIO, 2015, p. 267. ^ "Top Selling Artists". Recording Industry Association of America. Retrieved 23 June 2015. ^ "Certified Awards Search". British Phonographic Industry. Archived from the original on 15 March 2015. Retrieved 13 March 2013. ^ "Gold-/Platin-Datenbank ('Gold-/Platin-Datenbank')" (in German). Bundesverband Musikindustrie. Retrieved 6 December 2011. ^ "InfoDisc: Les Certifications depuis 1973" [InfoDisc: Certifications from 1973]. Syndicat National de l'Édition Phonographique (in French). InfoDisc.fr. Archived from the original on 21 June 2010. Retrieved 15 September 2009. ^ "SNEP: Les Certifications". Syndicat National de l'Édition Phonographique (in French). SNEP. Retrieved 21 February 2014. ^ "Rock Hall of Fame Inductions : Trey Anastasio Inducts Genesis". CBS News. Retrieved 1 December 2015. ^ "Nordoff Robbins Silver Clef Past Award Winners". Nordoff-Robbins. Retrieved 18 September 2015. ^ "30th Annual Grammy Awards". Grammy Awards. Retrieved 24 October 2012. ^ "Genesis honoured at Progressive Music awards". BBC News. 6 September 2012. Retrieved 6 September 2012. ^ Barnes, Anthony (3 October 2004). "Q: Which is biggest band of all time? A: And readers say..." The Independent. Retrieved 29 September 2015. ^ "For The Record". MTV News. 9 March 2007. ^ Singh, Anita (16 June 2008). "Duffy wins big with Mercy at Mojo Awards". The Telegraph. Retrieved 29 September 2015. ^ "BBC Radio 1 – Keeping It Peel". BBC. Retrieved 7 July 2013. ^ Bowler & Dray 1992, p. 1. ^ Alexander, Phil (30 July 2013). "Peter Gabriel: "Joe Strummer Used To Piss Me Off"". Mojo. Retrieved 11 August 2014. ^ Welch 2011, p. 37. ^ Hilburn, Robert (25 May 1987). "Pop Music Review : Genesis Strikes Out in Center Field". Los Angeles Times. Retrieved 25 April 2014. ^ Peter Buckley, ed. (2003). The Rough Guide to Rock. Rough Guides Ltd. p. 423. ISBN 978-1843531050. ^ Hedegaard, Erik (4 March 2011). "Phil Collins' Last Stand: Why the Troubled Pop Star Wants to Call It Quits (page 1)". Rolling Stone. Retrieved 9 October 2015. ^ "Genesis – Artist Discography". AllMusic. Retrieved 23 November 2018. ^ Andy Fyfe. "Proggy Style". Q. May 2007. Issue 250. p. 136. ^ McCormick, Neil (3 March 2011). "Phil Collins: should we take his retirement seriously?". The Daily Telegraph. Retrieved 22 December 2015. ^ McGuire, Colin (10 January 2014). "In Defense of Both the Phil Collins and Peter Gabriel Eras of Genesis". PopMatters. Retrieved 6 October 2015. ^ Bowler & Dray 1992, p. 172. ^ "Interview: Steve Hogarth of Marillion". Mstation.org. Retrieved 17 January 2008. ^ Interview with Graeme Murray in Classic Rock, March 2011, Issue 155. ^ a b c Frost, Matt (29 April 2015). "Steve Hackett talks Wolflight, phrasing and the nylon knack". MusicRadar. Retrieved 9 October 2015. ^ Lawson, Dom (8 October 2015). "Steve Harris: Genesis Was Never The Same After Peter Gabriel Left". Louder. Retrieved 31 October 2018. ^ "Simple Minds". AllMusic. Retrieved 6 December 2015. ^ "Will Sergeant". AllMusic. Retrieved 6 December 2015. ^ Easlea, Daryl (2013). Without Frontiers: The Life & Music of Peter Gabriel. Omnibus Press. ISBN 978-1780383156. Retrieved 22 December 2015. ^ "Abba receive Hall of Fame honour". BBC News. 16 March 2010. ^ Lambe, Stephen. "New Prog Rock festival hits Gloucester". BBC. Retrieved 8 October 2015. ^ Jasper Rees (3 December 2012). "Elbow, O2 Arena". The Arts Desk. Retrieved 6 December 2015. ^ Graeme Thomson (7 March 2014). "Elbow – Album By Album". Uncut. Retrieved 6 December 2015. ^ "ReGenesis : Early Genesis for the modern keyboardist". Sound on Sound. April 2009. Retrieved 1 December 2015. ^ "Mama, the all era tribute act to Genesis, returns to Bolton". The Bolton News. 30 September 2015. Retrieved 1 December 2015. ^ "Peter Gabriel-approved Genesis tribute band playing The Burt". MyToba. 9 November 2015. Archived from the original on 8 December 2015. Retrieved 1 December 2015. ^ "Playhouse Notes: Musical Box brings Genesis tribute". The Rigefield Press. 29 January 2015. Archived from the original on 8 December 2015. Retrieved 1 December 2015. Banks, Tony; Collins, Phil; Gabriel, Peter; Hackett, Steve; Rutherford, Mike (2007). Dodd, Philipp (ed.). Genesis. Chapter and Verse. Weidenfeld & Nicolson. ISBN 978-0-297-84434-1. Bowler, Dave; Dray, Bryan (1992). Genesis – A Biography. Sidgwick & Jackson. ISBN 978-0-283-06132-5. Buckley, Peter (2003). The Rough Guide to Rock (3rd ed.). Rough Guides. ISBN 978-1-843-53105-0. Collins, Phil (2016). Not Dead Yet. Penguin. ISBN 978-1-784-75360-3. Everett, Walter (2008). Expression in pop-rock music: critical and analytical essays. Routledge. ISBN 978-0-415-97959-7. Frame, Pete (1983). The Complete Rock Family Trees. Omnibus Press. ISBN 978-0-7119-0465-1. Hegarty, Paul; Halliwell, Martin (2011). Beyond and Before: Progressive Rock Since the 1960s. New York: The Continuum International Publishing Group. ISBN 978-0-8264-2332-0. Hewitt, Alan (2001). Opening the Musical Box – A Genesis Chronicle. Firefly Publishing. ISBN 978-0-946-71930-3. Martin, Bill (2002). Avant Rock: Experimental Music from the Beatles to Bjork. Chicago: Open Court. Platts, Robin (2001). Genesis: Inside & Out (1967–2000). Collector's Guide Publishing. ISBN 978-1-896-52271-5. Romano, Will (2010). Mountains Come Out of the Sky: The Complete Illustrated History of Prog Rock. Backbeat Books. ISBN 978-0-8793-0991-6. Rutherford, Mike (2015). The Living Years: The First Genesis Memoir. Thomas Dunne Books. ISBN 978-1-250-06068-6. Thompson, Dave (2005). Turn It On Again: Peter Gabriel, Phil Collins and Genesis. Backbeat Book. ISBN 978-0-879-30810-0. Welch, Chris (2011). Genesis: The Complete Guide to Their Music. Omnibus Press. ISBN 978-0-857-12739-6. Carruthers, Bob (2011). Genesis: The Gabriel Era – Uncensored on the Record. Coda Books. ISBN 978-1-908-53873-4.